I know I'm one in a sea of people obsessed with "Downton Abbey", but I am always blown away with how beautifully done the show is. Although I'm not really a snob about historical accuracy, I will say I have googled "Is _____ historically accurate?" more than a few times. It's nice to know what bits are plausible and which ones are included for storytelling. I definitely enjoy a show to a greater degree if the creators give some level of importance to accuracy. I am also completely obsessed with the idea of getting to dress up in period clothing from head to toe (and from undergarments to hair pins). It's my favorite thing to do for Halloween and I think even doing so in every day life would be magical (think Dita von Teese). Although I admire the glamour of the 1940's and the playfulness of the 1960's, there's something about the boyish figures and the short hair of the 1920's that I just love. I also really love Lady Mary's night gowns and robes. I've made it a goal of mine to collect (vintage) or sew sleepwear like that. The show itself obviously spans some time prior to the flapper era silhouettes, which is yet another reason I love to keep track of what each of the characters has been wearing. 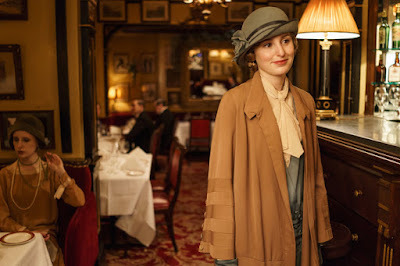 Lady Edith's recent changes for example, with her working in London and being more independent reflect in her wardrobe. All of this combined with the fact that the show is aired on my favorite television network and I cannot express how absurdly happy I am when I have time to catch up on an episode. I'm currently all caught up and waiting anxiously for today's episode to be online! Now get ready for the largest side-note in history (or skip it! ), but I have to confess I have a strange love for PBS, I've loved it since I was a kid. We didn't have cable or satellite TV so after school I'd come home to "Between the Lions" and "Sesame Street". My favorites were actually "Cyberchase" and "Arthur". Even now I still have a place in my heart for those shows, and I'm glad I got to watch them growing up. Of course, there's absolutely nothing wrong with "Spongebob" or whatever else was on cable, but I think PBS contributed to who I am as a person today. I even used to watch the "adult" shows about animals and space. Also, who else used to watch Huel Howser's show? It was the best! I think if I ever became a millionaire I'd donate boatloads of money to PBS (haha), but seriously. It's a bit mental how obsessed I am with the channel. I believe they air episodes of "Martha Stewart's Cooking School" now. I don't know. To be honest, it used to be my guilty pleasure when I was in high school, but now I revel in the pleasure of watching whatever I want. Okay, end of site note. I'm also currently watching their new show "Mercy Street" which I'm enjoying more and more as the characters develop. I'm not emotionally invested yet (thank goodness because it's midterm season) but I probably will be. I'm digging the Gone with the Wind vibes (sort of inherent in a Civil War era production I suppose?). Also, according to the interviews with the show's creatives historical accuracy is a priority. There's a lot of medical jargon and historically important dynamics within the show so I'd expect they'd get a lot of negative feedback if that wasn't the case. It's a plus at any rate. Okay, end of verbal train wreck masquerading as blog post.